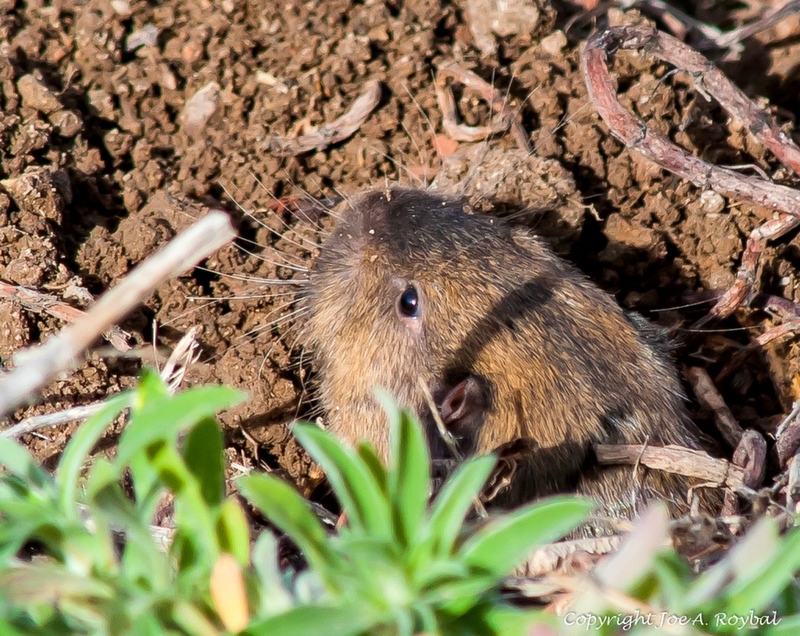 A gopher that popped his head out briefly while I was checking out a Pied-billed Grebe at a ditch at Bosque on Friday. Nothing special about the image, just an example of how, no matter how many times I go down there, there is always something new for me to see. I have been down there about 350 times and I always said that I saw something new each time for about the first 150 trips. On one of my last trips there a few years ago, I saw a Barn Owl's nest, a swarm of bees on a tree and, in a different spot, a wild honeycomb all for the first time. Nikon D700, 500f4P, TC 14B, f8@1/1250 sec., large crop. Please click on image. Thanks. This makes me smile, Joe. One day we were sat by a Scottish loch waiting for a sighting of Red Throated Divers (Red Throated Loons). We spent a good couple of hours watching a little vole dart out of its hole, run around, and then bolt back down its hole again. In and out, in and out, over and over. This kept us entertained for ages, trying to catch the little speeding bullet on his many appearances. As for the loons, they did eventually appear as little specks in the distance but too far away for photography. That little vole was worth all the waiting around.